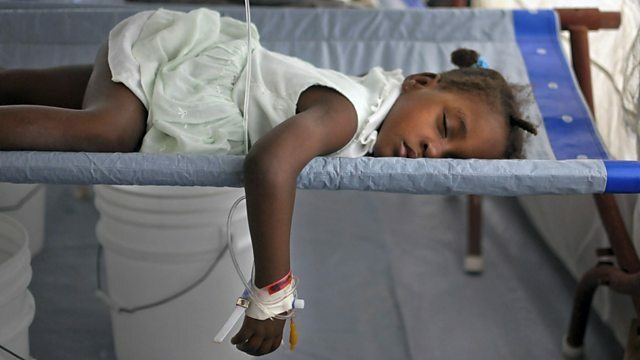 Who is responsible for the deadly cholera outbreak in Haiti? The blame has been laid at the door of the United Nations. The UN denies it is at fault. Mark Doyle investigates for Assignment. Almost seven thousand people have died of cholera in Haiti over the past year. It's by far the largest outbreak in the world today. But how did a disease - which has been absent from Haiti for over a century - arrive in the country? Poor sanitary conditions at a United Nations camp are being blamed for the outbreak. The UN has denied this but families of cholera victims are now demanding compensation from the United Nations. For Assignment, Mark Doyle follows the course of the epidemic and examines the controversy that surrounds it. This programme which was produced by Piers Scholfield contains a graphic account of cholera symptoms.